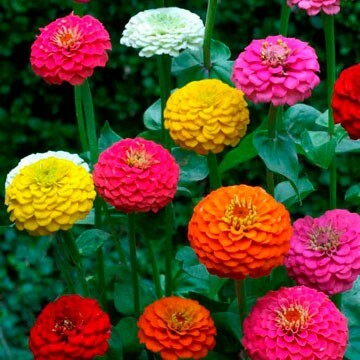 Lilliput Zinnia-(Zinnia Elegans)-This species of Zinnias is known for it's attraction of butterflies. It blooms in Pink, Red, Orange, Bright yellow and white. They grow to a height of 18-24 inches. Spacing is suggested at 9-12 inches. They bloom repeatedly during summer through late fall. For earlier blooming start indoors a few weeks before end of frost. This flower is an annual that requires regular watering but not overwatering. They do best in full sun.